The worldâ€™s first sexdoll â€“ or â€gynoidâ€ â€“ was built in 1941 by a team of craftsmen from Germanys Hygiene Museum Dresden. The project was supervised by the famous preparator and technician Franz Tschakert. 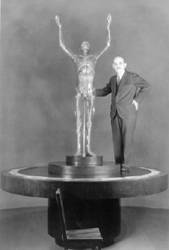 The â€Father of the woman of glassâ€, which happened to be the sensation in 1930â€™s II. International Hygiene-Exhibit, used his skills and experience in order to create a kind of doll the world had never seen before. The â€field-hygienic projectâ€ was an initiative of ReichsfÃ¼hrer SS Heinrich Himmler, who regarded the doll as an â€ counterbalanceâ€ (or regulating effect )for the sexual drive of his stormtropers. In one his letters, dated 20.11.1940 he mentions the â€unnessessary lossesâ€, the Wehrmacht had suffered in France inflicted by street prostitutes. The project â€“ called Burghild in the first place â€“ was considered â€Geheime Reichssacheâ€ , which was â€more secret than top secretâ€ at the time. Himmler put his commander-in-chief SS-Dr. Joachim Mrurgowsky in charge, the highest ranking officer of Berlins notorious SS-institute. Between June 1940 â€“ 1941 IG Farben had already developed a number of â€skin-friendly polymersâ€ for the SS. Special characteristics : high tensile strength and elasticity. The cast of a suitable model proved to be more difficult. â€Three types of dolls were planned : Typ A :168, Typ B : 176, Typ C : 182 cm. Typ B would be the first to go into serial production. The members of the project were divided about Borghildâ€™s breasts. The SS favoured them round and full, Dr. Hannussen insisted on â€œa rose hip form, that would grip wellâ€ and he won the dispute. The first model of Borghild was finsihed in september 1941. She was exactely the â€œnordish typeâ€. The idea of our hairdresser to give the doll a â€œSchneckenfrisurâ€(earphones of hair) was rejected by Hannussen. He wanted her to have â€œa boyish hair-doâ€ to underline that Borghild was â€œpart of the fighting forcesâ€â€“ a field-whore and not an honourable Mother. Borghildâ€™s presentation in Berlin was a great success. Himmler was there and Dr. Chargeheimer. While the gentlemen examined her artificial orfices , Franz Tschakert was very nervous, but Himmler was so enthusiast that he ordered 50 Borghilds on the spot. It was considered to move to a special production facility , because Tschakertâ€™s studio was too small to cope with the production of 50 dolls. In the face of more and more unpleasant developments in the east Himmler dropped his plans one week later and cut instead our budget. 1. It can drink biere.